Motivational Poems, Inspirational Sayings, and Meaningful Positive Life Quotes You Know and Love Now with Reflection Questions. A Self-help Tool for Anyone Interested in Their Own Personal Growth and Development. 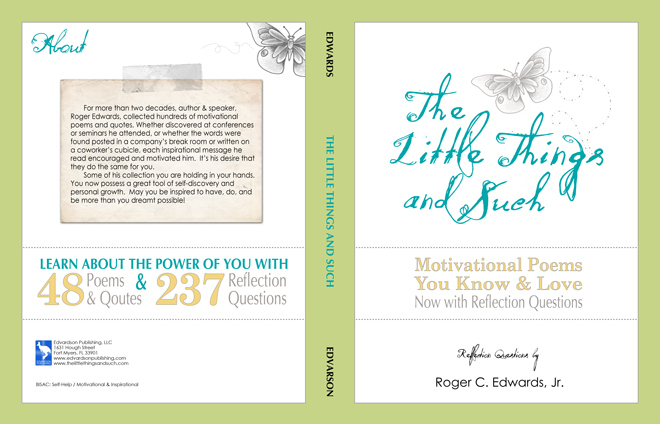 For more than two decades, author & speaker, Roger Edwards, collected hundreds of motivational poems and quotes. Whether discovered at conferences or seminars he attended, or whether the words were found posted in a company’s break room or written on a coworker's cubicle, each inspirational message he read encouraged and motivated him. It’s his desire that they do the same for you. Some of his collection you are holding in your hands. With 50 motivational poems and 247 reflection questions, you now possess a great tool of self-discovery and personal growth. May you be inspired to be, have, and do more than you dreamt possible!